At 3:05 PM on Tuesday, February 1, 1968, WKYC debutes “Power Radio” to Cleveland listeners. This unabashed and bold announcement was broadcast to an unsuspecting audience. The announcement lasts about 1 1/2 minutes, then it goes right into the Chuck Dunaway show with a brand new “Power Radio” jingle. One has to wonder what WKYC did BEFORE this ‘Power Radio’ presentation. One doesn’t even know how long the station called itself that. Well, okay, someone out there does. But what was the reason for the ‘change’? Why POWER RADIO? Seems to me, this slogan was tried again in the 80s, as a number of CHR stations used it in their presentation. Whatever this was and how well it worked we don’t really know. All we can say is this runs about 3 minutes long, and what you hear, is pretty much all the listeners got. It all pretty much all sounded the same in the 60s. So WKYC Was The Grandfather Of All Power Stations Huh? No, I wouldn’t say it was the grandfather.. but wow, you sure would think so based upon this loud boasting promo. The PD had some testosterone, to be sure. I’ll have to do some research but its possible that the slogan POWER RADIO might well have been used first here. As a 14 year old radio geek, read “dx’er”, when this happened, it blew my mind. I would listen to WKYC in Wisconsin nightly! Basically, what was done it, the “Fun Vibrations” jingles were dumped, the “Sound Eleven Survey” was scrapped (22 songs…11+11) for the “WKYC Power Poll” of 40 songs. Hitbounds were labeled “Potential Power” and the oldies, as I remember, were “Past Power” to reinforce the “power” label. What I do remember was the Power “personalities” being really tightened up! So basically it was a “tightening” of the format, or freshening up. Not a format change, but a different focus. What I find interesting is that this is the earliest/first example of a station using the POWER slogan, and it was way back in 1968. Some ideas we thought originated in the 80s actually didn’t. I could check on my own, but for the sake of discussion, when did 1100 become WWWE? I remember the 3WE slogan and jingles as far back as about 1980 or 81, when I first started paying attention to that sort of stuff, then when they changed to WTAM, I thought they lost their minds. I can tell you, when I was a teenager back in 1980, I had no idea that the station in Cleveland had been a big Top 40 station or had the WKYC calls. That realization, honestly, came as I built this website and started doing serious research into the recordings I have at hand. Perhaps one day I’ll be the recognized expert radio historian, haha. They were fighting WIXY at the time. It was really a good station, and wasn’t it within a few years PAMS would come out with the Music Power jingles. Well I Guess It Safe To Say If It Weren’t For WKYC AM, WUSL, KPWR, KKFR, And Others Wouldn’t Except The “Power” Branding Huh? Vaughn B. No, thats not what I meant at all. All the other ‘power’ stations would still have come along Vaughn. It was just simply odd to think that WKYC used that logo in 1968, WAY before the FM versions! Virgil Dominic ends WKYC News. He’d been with the NBC station for a few years and was Marin evening anchor. He did the daily 5pm NBC network radio newscast from Cleveland. The Power Radio intro is by PD Chuck Dunaway, who was also PM drive jock. Consultant was Hal Moore. Charlie and Harrigan in mornings, Bob Cole (a Draper WKYC holdover) in middays, Dunaway in PM drive, evenings were Buddy Harrison for a while, until he left for CKLW as Ed Mitchell, and then for the West Coast as Mark Elliott. Lee Baby Simms also did nights. Fred Winston was fill-ins until he left for KQV On his way to ABC’s station in Chicago (WLS). Main evening anchor, I should say. 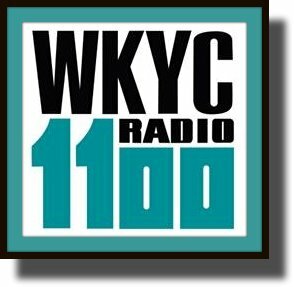 From what I understand, despite having the strongest radio signal in Cleveland (day and night), the brass at the NBC network in New York (who directly owned WKYC at the time) refused to budge with the network programming schedule on 1100. As hyped-up and hot-sounding Power Radio was, to have to stop each hour for dry, serious news reports, and their “Monitor” programming on the weekends, there was really no chance for Power Radio to become a real threat to rival stations WIXY and CKLW. It was also around this time (give or take a year or so) that WHK was on it’s way out of the Top 40 biz while WGAR was getting ready to bring on Don Imus and Top 40 to 1220 AM. Needless to say, the Power format did not last too long, and WKYC then switched to an Adult Contemporary/Middle of the Road (MOR) format which meshed better with the network programming. Well The Power Phenomenon Doesn’t Come Until 1982 When WUSL FM In Philadelphia Revive The Power Name As POWER 99fm. February1, 1968 was Thursday, not Tuesday. WMCA in NYC called itself “Power Radio” near the end of its run as a top-40 station. In 1970, WMCA turned to a talk format. As a recall, Kevin Metheny’s father, Terrell, was the PD at WMCA when “Power Radio” was used as a slogan. And today is February 31st … I think. As you probably know, Kevin Metheny died a few months ago. Kevin had just been hired as PD of KGO in San Francisco. I first met him at WKY in Oklahoma City in the early 1970’s. As you may remember, he was the PD at WNBC and was referred to as “pig vomit” by his employee, the famous (or infamous) Howard Stern. Kevin was anything but, and most importantly, Kevin truly loved his family. Once Kevin told me, “You’ve got to hear my dad, if you haven’t.” He sent me a link of Terrell when he was in Nashville. KYW 1100 Later it switched to WKYC as it switched locations with the NBC stations in Philadelphia. The original WTAM was better run as part of Westinghouse with all the great announcers Jay Lawrence was brother of comedian Larry Storch. Harry Martin went to San Diego. Specs Howard opened broadcast schools. Jim Runyon, Jim Stagg and Jerry G Bishop went with PD Ken Draper to Big 10 WCFL Chicago to battle ABCs 89 WLS.